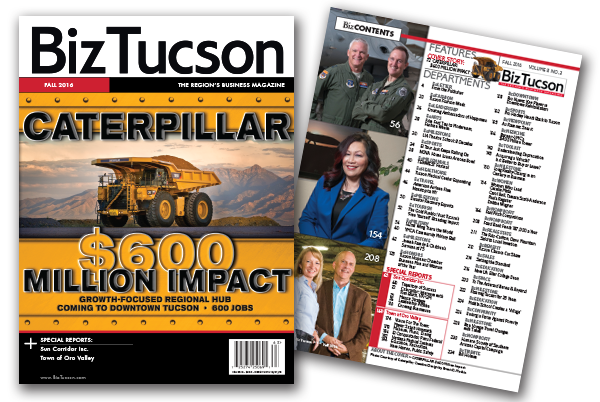 This is how journalist Rhonda Bodfield set the tone for an in-depth interview with Caterpillar VP & GM Tom Bluth, who will lead the new division. 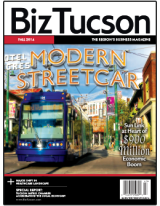 As our cover states, this new hub is projected to have a $600 million economic impact over a five-year period, according to Gov. 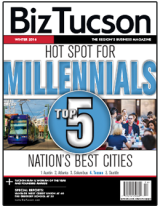 Doug Ducey’s office. 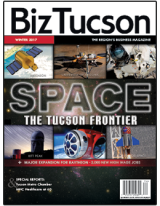 Reading this Q&A will give you impressive insights about how our community and its leadership came together to attract this company not only with incentives but also a “soft landing” program to assist relocating employees. 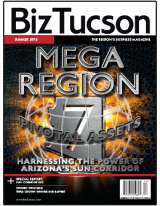 Leading the economic development charge to attract Caterpillar was Joe Snell, president and CEO of Sun Corridor Inc., along with Arizona Commerce Authority, Gov. 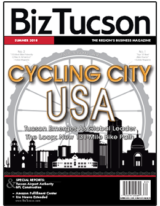 Doug Ducey, Pima County, City of Tucson and Rio Nuevo. 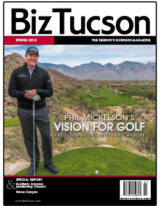 Snell said, “Together with all the partners, we each brought significant resources to the table to win the biggest deal Tucson has seen in 25 years. 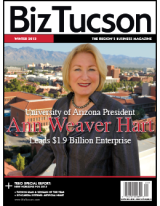 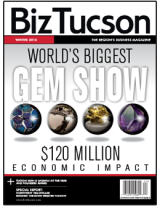 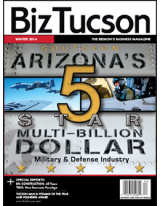 Now people are asking – ‘what’s going on in Tucson?’ ” Read our Sun Corridor Inc. special report that starts on page 65. 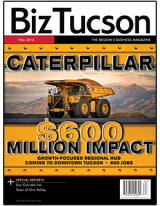 Caterpillar’s expanding division will be in Downtown Tucson. 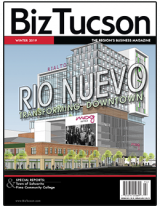 The Rio Nuevo board helped seal the deal. 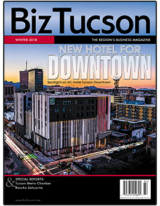 Dan Sorenson offers a compelling look at Rio Nuevo’s successful projects that have been a catalyst for the revitalization of our city center, which includes the AC Marriott Hotel, TCC upgrade, new minor league hockey team − and now Caterpillar. 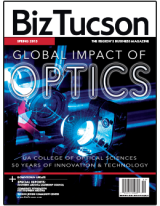 Another special report focuses on the Town of Oro Valley and the vision for its future, as shared by Mayor Satish Hiremath. 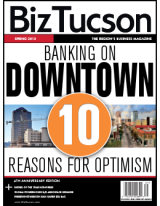 Our team of contributors focuses on the diverse elements that make this town a desirable place to live, work and play. 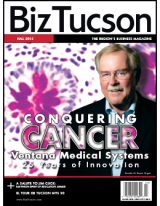 Read about the town’s business growth, as well as Roche/Ventana’s expanded operations, where scientists are developing tissue-based diagnostic solutions for patients worldwide. 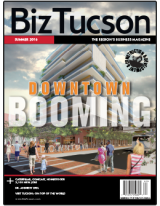 An exciting new development takes off Oct. 6 that will quickly energize our tourism economy. 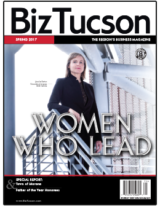 With the Tucson Metro Chamber’s leadership, American Airlines recently announced nonstop service to New York’s John F. Kennedy International Airport. 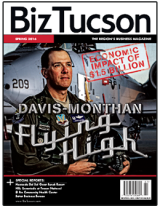 Chamber President & CEO Mike Varney is quick to praise the unwavering leadership of Bill Assenmacher, who chaired the air service task force. 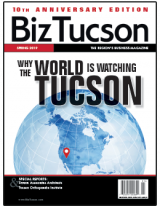 This summer Visit Tucson introduced a marketing campaign to entice more New Yorkers to travel here − another component of its high-impact “Free Yourself” branding. 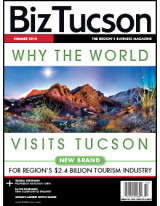 Learn about this forward-thinking, research-driven travel brand in our report on Visit Tucson’s annual meeting. 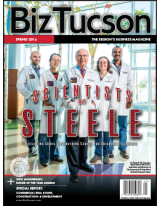 When companies relocate to Tucson, our small-town feel and strong sense of community are positive attributes cited. 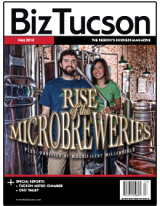 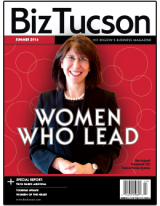 This edition spotlights some of our city’s finest nonprofits − including the Boys & Girls Clubs of Tucson, Community Food Bank of Southern Arizona, Humane Society of Southern Arizona, Jewish Community Center, Jewish Family & Children’s Services and United Way of Tucson and Southern Arizona. 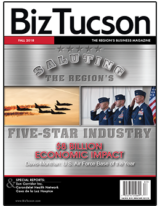 Upcoming events to support our nonprofits to include El Tour de Tucson, Nova Home Loans Arizona Bowl, Tucson Classics Car Show, Tucson Fashion Week and the new YMCA ball honoring all five branches of the military. 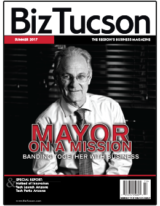 The support of our business community and the boundless energy of thousands of volunteers continue make this region a great place to live. 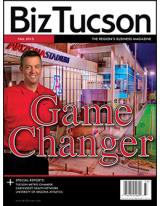 One such volunteer was Bill Holmes, who passed away suddenly on July 18th. 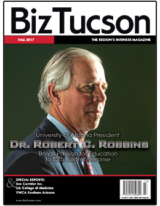 Mary Davis contributes a heartfelt tribute about this vibrant individual who cared so deeply about his community, his friends and most importantly, his family. 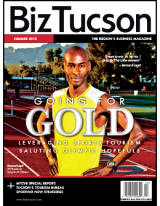 He was an inspiration to many.